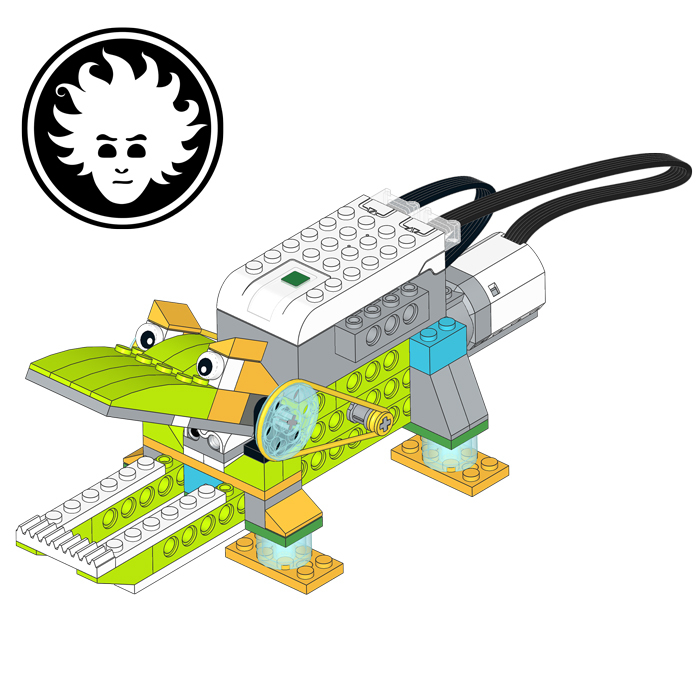 In my freelance LEGO designer activity, I often got requests from clients to realize custom LEGO MINDSTORMS robots, automatic industrial models, but also static models built with plain LEGO bricks. 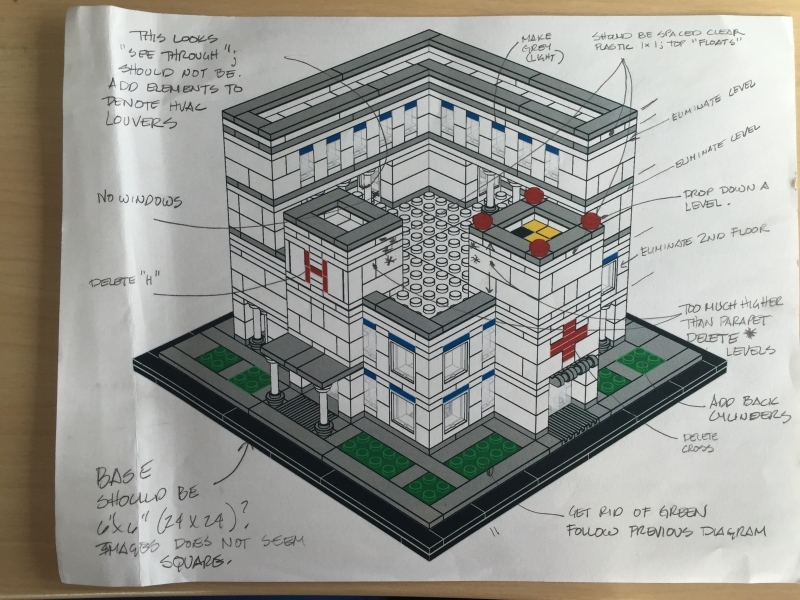 This time, the client (an healthcare consultancy company) wanted a custom LEGO model, to be distributed as a kit, representing a small LEGO hospital, or clinic. 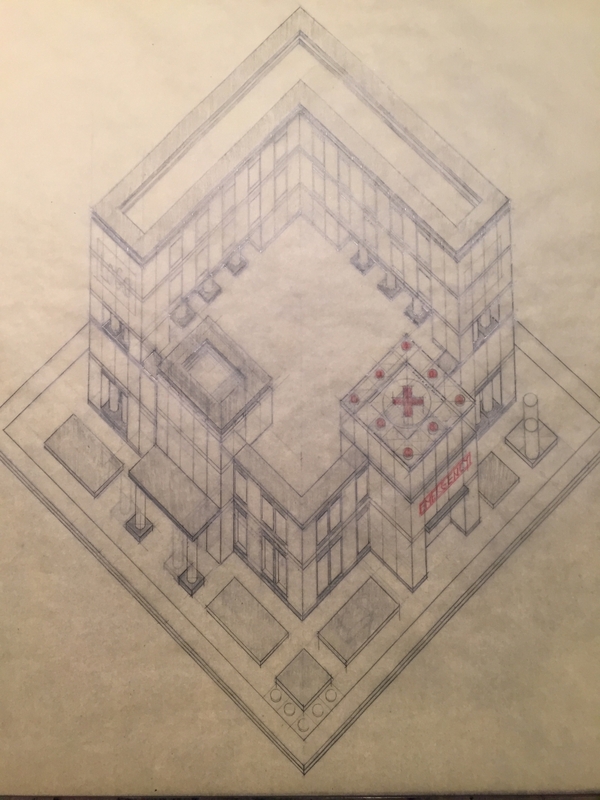 The uncommon and surprising thing was that the CEO of this company was also an architect, and sent a detailed sketch of how he wanted the model to look like. The hand drawn sketch is an isometric view of the LEGO hospital, where the architect tried to indicate all the details he wanted the model to show, and he tried to respect the proportions of the LEGO bricks and plates. This was a very useful guide to start the design, although I had to change the building dimensions and adapt the design to use existing LEGO parts. One of the trickiest detail to render were the slim columns. 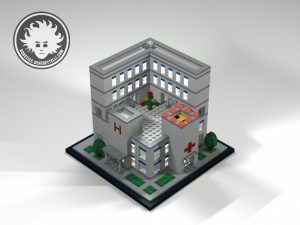 I started modeling the LEGO hospital in LEGO Digital Designer (LDD) using the provided sketch, then I exported it to the LDRAW format, and I rendered it using POV-RAY. As you can see in the resulting rendering, I added trees, grass and some flowers on the terrace. The model features an helicopter landing pad, and an H letter made with a SNOT lettering technique described here. I sent the first rendering to the client to review it. I removed trees, and flowers. 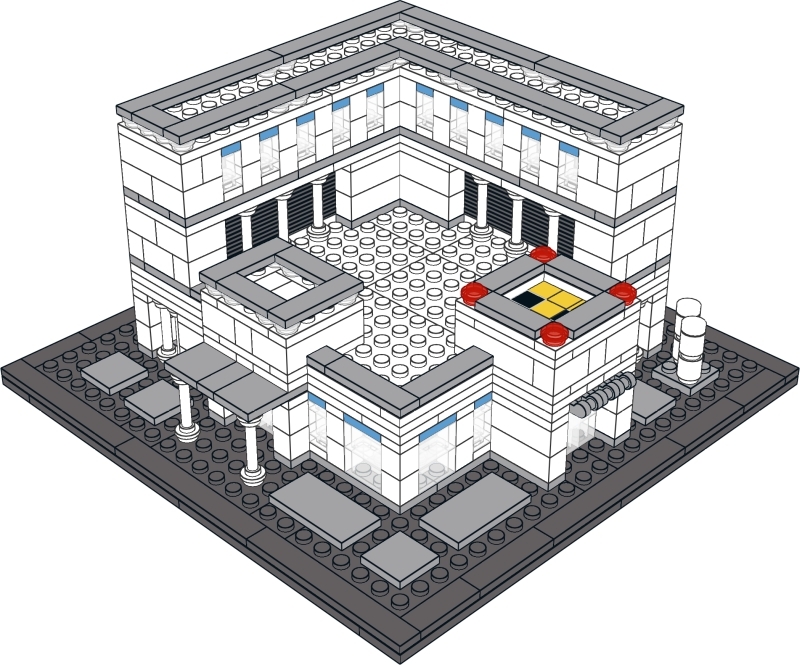 To cut the number of parts and thus the cost, I had to reduce the overall height of the microscale building. 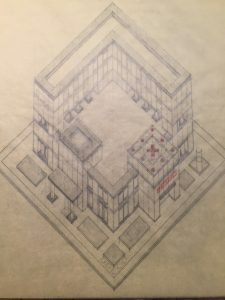 I sent another rendering, and got detailed comments. 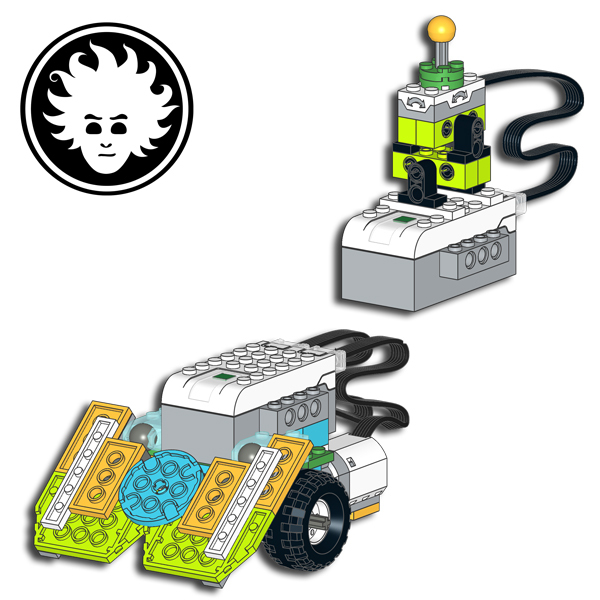 Unfortunately, after having spent days on designing and refining the model according to the client’s comments, in order to give them a precise estimate of the cost of the custom LEGO set, the client disappeared from all the radars. I tried to contact the client, but he replied he was not interested anymore. In the end, I worked a lot for free. This bad experience was indeed helpful, because it changed my working habits, and since then I don’t start a detailed design job without a proper agreement. 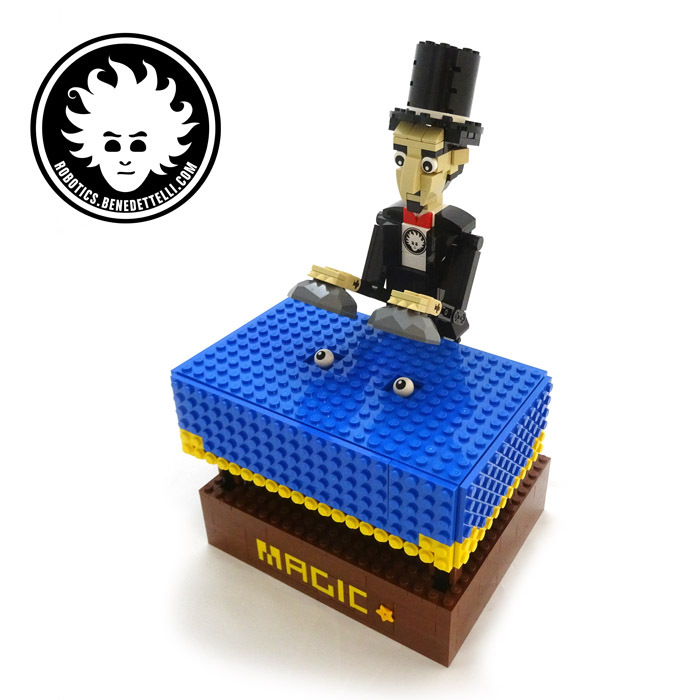 I learned to make cost estimates for custom LEGO models without designing them completely. The good outcome of this story is that you can download the instructions and build this custom LEGO hospital. The file is distributed as is, and no support will be given about its usage. You can use the file only for personal, non-commercial purposes.